Better constituent service – at a lower cost. We understand your challenges. Your budgets are tight and the public demands accountability and service. Datamax Arkansas allows you to focus on delivering stellar service while lowering costs, automating processes, and helping you do more with less. Manage and store documents – paper and digital. Fast communication in the field for public safety officials to react to threats faster. Reduce expenses by transitioning slow, paper-based workflows to automated business processes with workflow and forms processing automation. 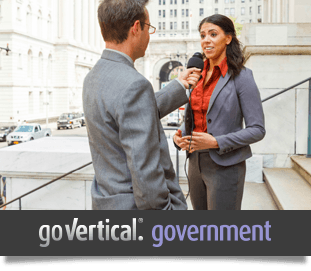 Protect government records with DoD 5015.2-Certified records management. Save on printing costs (and maintenance) with managed print services and the right mix of digital copiers and printers. 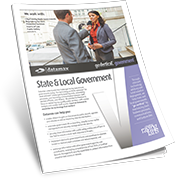 State and local governments (and governmental agencies) go Vertical® with Datamax Arkansas to save taxpayer's money while providing improved services. “We just thought that you should know what a great job your employee, Hugh (our Sales Representative), has done for you AND for us. We have been a customer of Hall's Business Machines/Datamax for over 25 years, and we have to say that our relationship has never been stronger. We have to attribute this to your representative, Hugh. Let us explain. Many Sales Consultants are in it for the short term and for the quick buck. Hugh, on the other hand, seems to believe in creating lasting relationships based on trust and communication. He is there before the sale, during the sale, and long after the sale, Needless to say, with that kind of relationship, he is our "problem solver" as opposed to a "problem creator." He always listens to our needs and helps us find the best solution for our problem. And that solution may not be the one that creates the most income for the company and for himself. Again, this is why we keep going back to Hugh and Datamax. We don't know Datamax. We do know Hugh. He is the face of Datamax and you could not have a better "face" out in the community. He is timely and professional in all matters. Don't tell him we said this, but we even enjoy his visits when he is just checking in on us. We don't look at these visits as sales calls but more as a visit from a good friend whom we trust and enjoy working with. We would just like to say thanks for fostering the kind of service provided by Hugh. We look forward to a continued relationship with Hugh and Datamax in the upcoming years."